It’s your wedding day: a day when all your closest friends, family members, and loved ones are going to have their 👀 and 📸 pointed at you. So, you’ll want to look your absolute best and make it the most wonderful, memorable, happiest day possible. And a happy, happy day means lots of smiles. That’s where Snow, the team behind the actual BEST at-home teeth whitening product, comes in. 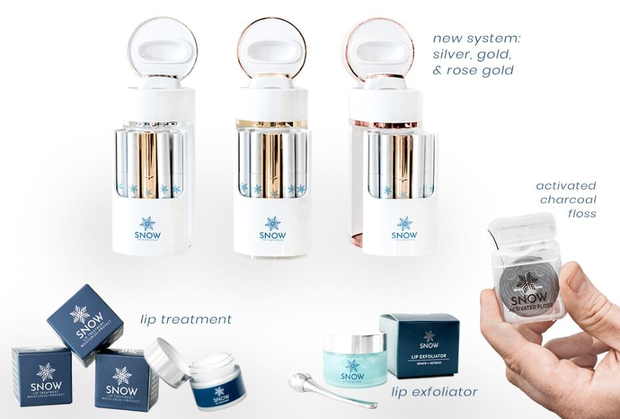 Snow is a direct-to-consumer teeth whitening system that is proven to work five times faster than white strips and is even recommended by dentists for its exceptional whitening formula and attention to overall oral health (not just the cosmetic side of things, although it’s pretty damn sparkly). Sure, it sounds tempting to go in on a professional whitening treatment (you’re only getting married once, right? ), but considering how expensive and uncomfortable it might be, you’d probably have a much better time DIY-ing it. And seriously, we don’t say that too often, because a wedding is a big deal; a lot of the time, professionals have a way of doing it better, they just do. Professional whitening regimens are known to cause crazy intense sensitivity - not exactly something you’ll love or welcome when your sensitivity over a major financial undertaking is already heightened. You’ll need the coffee, wine, and ice cream to get through the planning process, so extra tooth sensitivity won’t be great. These treatments can cost thousands of dollars. Thousands. So, if you’re already contemplating ways to eliminate superfluous line items from your budget spreadsheet, a trip to the dentist (for something other than a checkup) might not be smart. 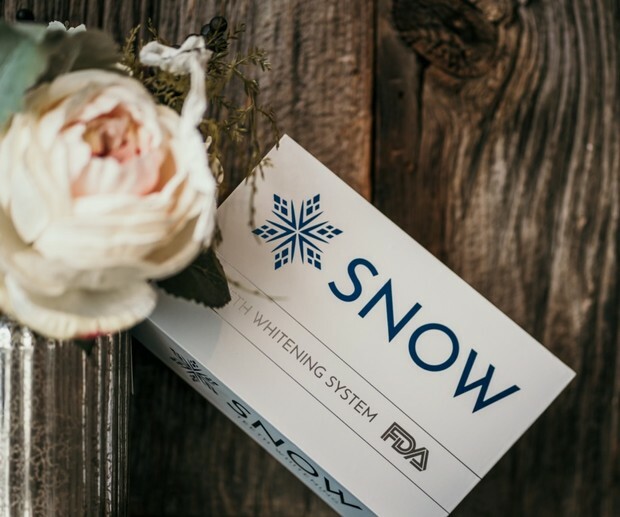 Snow’s whitening kit guarantees professional-grade whitening results, from the comfort of your own home (#whitecoatsyndrome right here, so any excuse to avoid an office visit is 🙌), and it’ll cost muchhh less than it would to see a dentist about it. The results start showing quickly! The best part about using Snow leading up to your wedding day is that results usually start showing up within just three days!! So, whitening your teeth will be one less thing to worry about while gearing up for married life. Plus, unlike plenty of other whitening methods, Snow’s formula does not cause sensitivity or pain. If you do happen to be predispositioned to sensitivity, though, they offer a phenomenal desensitizing serum that can used with Snow’s maximum strength serum (for the most intense whitening possible). It’s safe to use everyday, until you’ve achieved your desired whiteness, and then you can scale back the whitening sessions to maintain the results. Seriously, they’ve got everyone covered! Celebrities included… And who wouldn’t want to have a Hollywood hottie-level smile on their wedding day?! But Tinseltown-worthy teeth aren’t the only prerequisite to a perfect wedding day smile. Just like the saying a pretty dress does not make the bride, your stunning smile is the sum of its parts (bright, white teeth, soft, supple, pouty lips, the whole shebang). 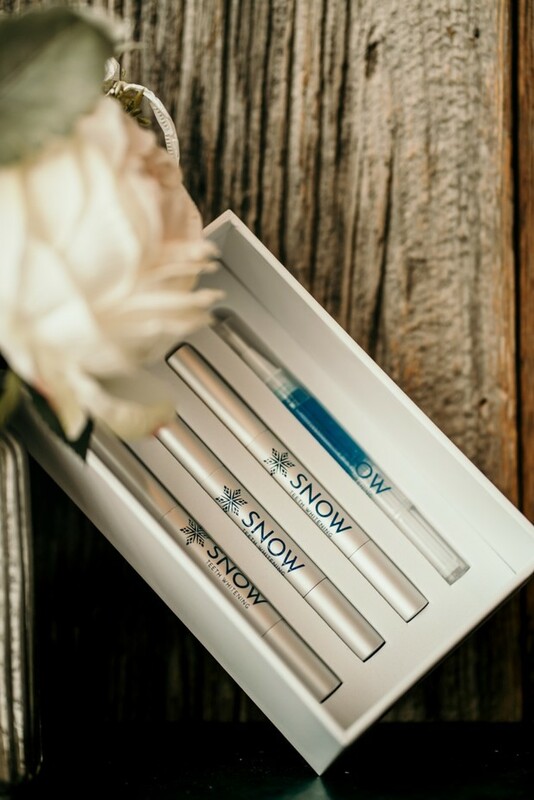 Snow offers more than just teeth whitening, in fact, they have a complete oral care routine containing an activated charcoal floss, an exfoliating lip scrub, and a moisturizing lip treatment so all of your oral care needs are met. 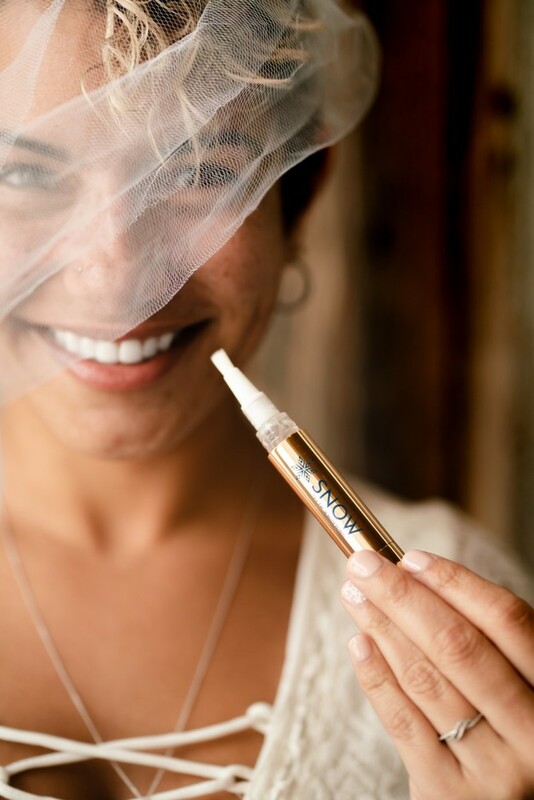 Use the maximum strength serum on your wedding day, while you get ready, and then whiten with the wireless LED mouthpiece hands free and stress free. Because Snow’s system is so effective and reliable, your smile will be one less thing you need to worry about the morning of your wedding. Instead, spend that time thinking about the special someone who will be waiting for you at the end of the aisle oh so soon. Before you get to the aisle, though, make sure your routine is sparkling clean. The activated charcoal floss is a great addition to the teeth whitening kit, because it actually whitens in between teeth. Charcoal is known for absorbing plaque and bacteria, so it’s a great addition to your makeup bag. The exfoliating sugar lip scrub is packed with beneficial ingredients to naturally heal your lips and remove any dead skin cells on the surface that may prevent the soft, luscious, kissable lips underneath. The scrub comes with an applicator that can double as an under eye roller to get rid of puffiness that you can blame on tying the knot-triggered lack of sleep. Ditch the refrigerated spoons and use this great cooling tool for both your lips and your under eyes. Those swollen under-eye bags can pack their bags and say buhbyeee. And with Snow, you’ll never have to deal with [snow]flakes. We mean product AND people. Snow has a five-star rating on Amazon and is loved by thousands of people worldwide. This is because Snow puts its customers first in terms of whitening results and shopping experience. The customer service team at Snow is fantastic and is dedicated to helping users out with any needs they may have. Additionally, Snow ships in the U.S. for free and internationally for just a small shipping charge. 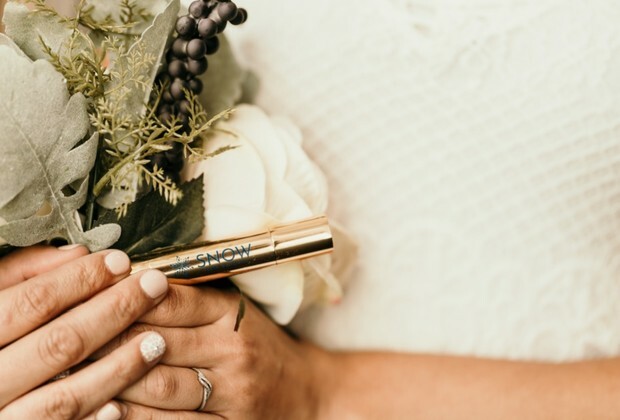 Overall, Snow provides brides, grooms, and couples as pairs with great, reliable, professional results safely and quickly. During a time when you might worry about everything, you’ll never have to worry about your smile looking yellow in pictures for years to come. #weddingphotogoalsforever. Get Snow now and start preparing for the perfect smile on your wedding day. Your guests and partner (if he or she isn’t already whitening with you) will be so impressed with your results, they’ll want to get on board as well! 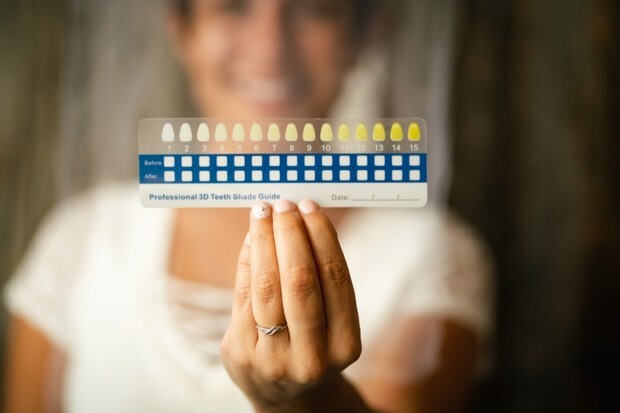 We partnered with Snow Teeth Whitening to give newly-engaged couples everywhere some pointers on those pearly whites. As always, thank you for supporting our sponsors!